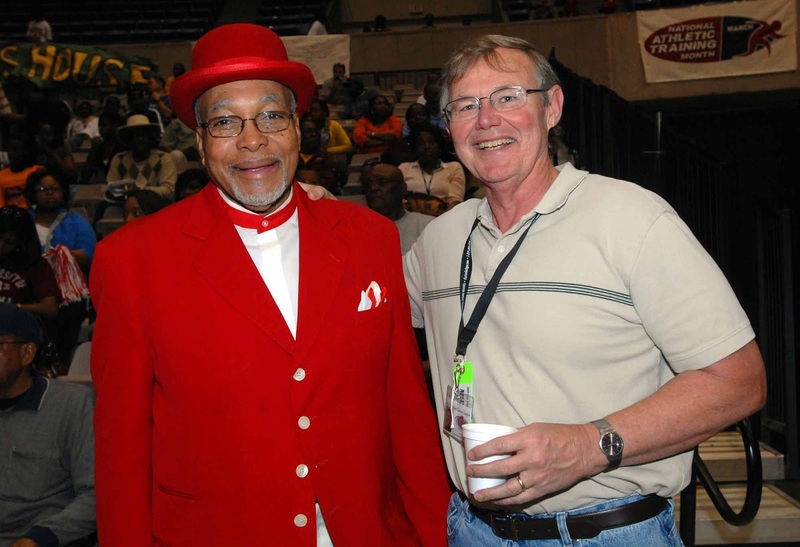 Lafayette Stribling and me at the MHSAA State Tournament in 2010. This is a Clarion-Ledger column I wrote on Lafayette Stribling back in February, 2004, when he was coaching at Mississippi Valley State. Strib retired from Tougaloo Tuesday after a truly remarkable 55-year career in coaching. Strib is a Mississippi treasure. ITTA BENA − Fifty−one years ago, Lafayette Stribling, the son of poor Leake County sharecroppers, graduated from Harmony Vocational High School in Carthage. He had to borrow a friend’s suit for the ceremony. “I promised myself, ‘One day I’m gonna have me a suit of my own, and I’m not going to have to wear somebody else’s clothes,’ ” Stribling said Monday afternoon in the living room of his Greenwood home. Boy, did Lafayette Stribling − Mississippi Valley State’s basketball coach and Strib to his friends − ever keep that promise. No visit to Stribling’s Greenwood home is complete without a visit to his “closet.” The closet is actually a converted bedroom containing approximately 200 mostly tailored suits of all cuts and colors, 12 tuxedos, nearly 200 pairs of shoes, about 50 top hats and one mink coat that cost more than Stribling used to make in a year. For Valley’s SWAC regular season championship−clinching victory over Prairie View Monday night, Strib chose a dashing yellow number, a Giorgio design, with a purple shirt, purple− and yellow−striped tie, purple shoes and purple socks. You’ll have to trust me on this: Most of us would look silly, but Strib looked like he was born to wear that suit. And basketball is his business. The 58−39 victory Monday night was the 299th of Stribling’s Valley career. He won more than 900 games as a high school coach, mostly at South Leake, before the Valley job came open in 1983. Hard to believe now, but Strib was actually MVSU’s second choice for the job. Jim Coleman, then Valley’s athletic director, offered the job to Rust College’s Leland Hays first. “He turned it down,” Stribling said, chuckling. “He took one look at the schedule and one look at what he had coming back and said he couldn’t win a single game. Strib drove to Itta Bena the next day − in a green suit and red tie (Valley’s colors), of course, and took the job. He did, and MVSU basketball − and Stribling’s closet − have prospered since. Valley finished 15−12 that first season, marking the first winning season the school had achieved since elevating to Division I. Just as importantly, Strib spent much of that first year on the recruiting trail, signing such future stars as George Ivory, Mark Coleman, Joe McKinley and brothers Mike and Keith Ferguson. Four years later, those players would be the cornerstone of the most famous Valley team in school history and the most famous underdogs in college basketball history. Valley won its first SWAC title that year, then faced top−seeded Duke in the first round of the 1986 NCAA Tournament in Duke’s backyard in Greensboro, N.C. It was No. 1 vs. No. 64. Prohibitive underdogs, the Delta Devils scared the bejeeezus out of the Blue Devils, leading by 7 in the second half before losing four players to fouls and losing in the final two minutes. Duke fans gave Valley players − and the resplendent Strib − a standing ovation. It was the first of three trips to the NCAA Tournament for Strib−coached Valley teams. Can’t you just imagine how much he’d love to make it four this year at an age, 69, when most of his peers have long since quit coaching? Now in his 47th season, Strib has survived prostate cancer, congestive heart failure, two leaking heart valves and an irregular heartbeat. But he has lost more than 20 pounds on a new fitness routine. “I’ve never felt better,” he said Monday afternoon. He has rarely, if ever, coached better. Heading into a Saturday night game at Jackson State, Valley, picked to finish in the middle of the SWAC pack, has run away from the field with a 13−2 league record, 19−6 overall. How to dress is only part of it. I am looking for Coach Striblings to tell him about our up and coming college reunion ( Mississippi Industrial College). I am part of the younger generation graduate but I want so very much to contact him to tell him about the reunion and the coming together of all ages this summer. I for one, think of it as being an honor to meet someone who has been so successful from our small college. We our the name Mississippi Industrial College to live on even after we are gone. I am also looking for Gloria Scott who I was told work there. I would like to talk to her also in reference to the reunion and I would appreciate your help in reference to contacting both. You have my email and my twitter address is Micbwalker and my phone number is 601-896-1000. Because I will not reconized the number should either or you all call should you wish to do, please leave a message in reference to my email. Thank you for your time and I hope results in reference to my email.